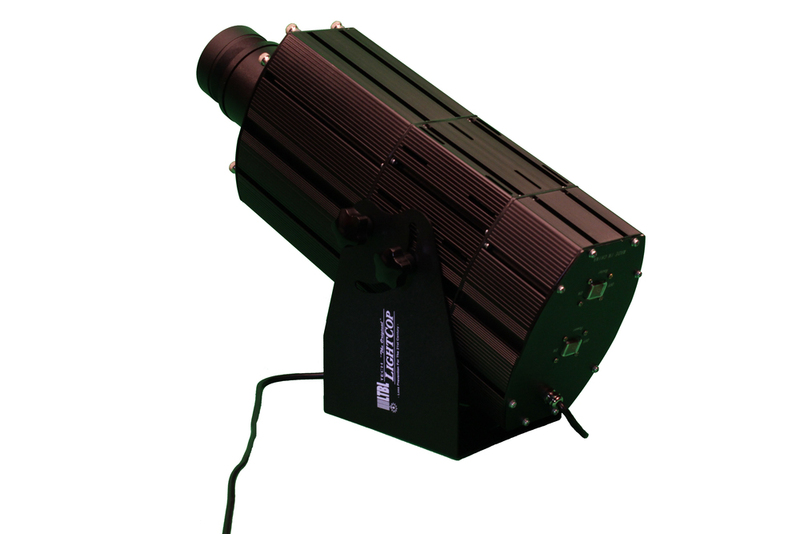 LightCop is an easily installed, plug and play, industrial light projection system. 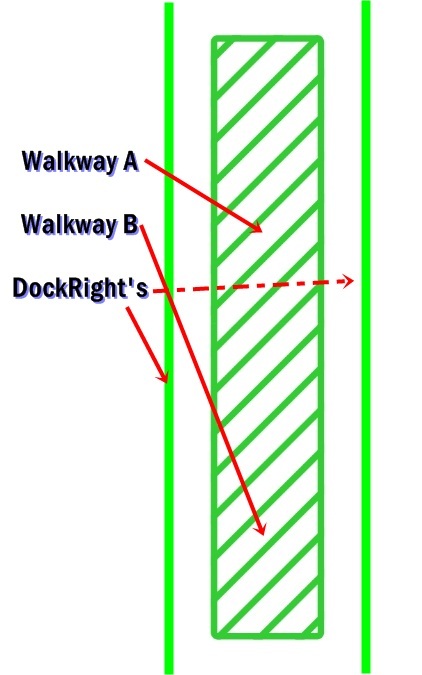 Traffic control signage (such as STOP, YIELD, or NO PEDESTRIAN TRAFFIC) or general warning messages (such as DANGER FORKLIFT TRAFFIC or DANGER OVERHEAD CRANE) are brightly projected on the floor from a projector mounted overhead from a horizontal I-­beam, upright support, or drop­down conduit. The image is projected through a glass and metal “slide” called a GOBO, which is an acronym for “go before optic.” As the light passes through the GOBO and is focused via the lens, a traffic control sign made of light is created. This bright signage can be easily moved from one location to another, can never be damaged or destroyed, and is always visible despite minimal ambient lighting. We offer a number of different stock GOBO images, but we can custom design any unique image or message you choose. But the image displayed is only part of the message. 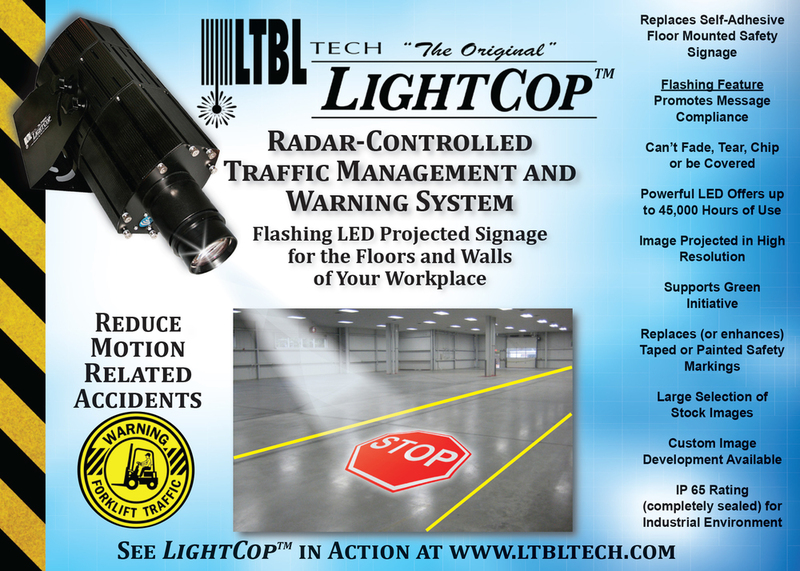 What sets LightCop apart from the usual painted, taped, or adhesive backed signs is the on­board, motion detecting radar. If a person or heavy equipment approaches an intersection, the traffic control signage begins a FLASHING sequence that continues until movement is no longer detected. This feature was added in an attempt to help your facility drive compliance to your safety protocol. Once the radar module no longer sees movement, the sign returns to the steady on, non flashing mode. 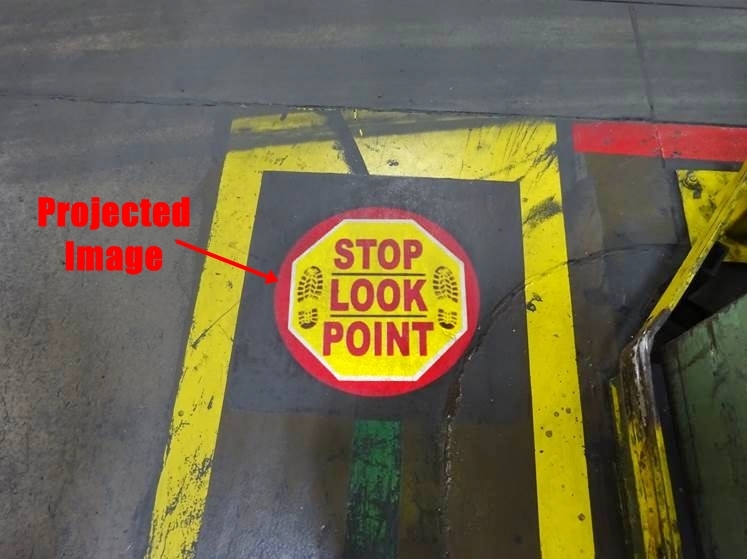 Traffic directives that are painted on or taped to the floor in a busy industrial environment tend to become part of the landscape and are often ignored. A flashing message, such as STOP greatly can help increase compliance ultimately contributing to reducing accidents. Designed for harsh environments, the plug and play LightCop boasts a high intensity LED light source component and a high­ definition ground glass lens system housed within a robust industrial casing. 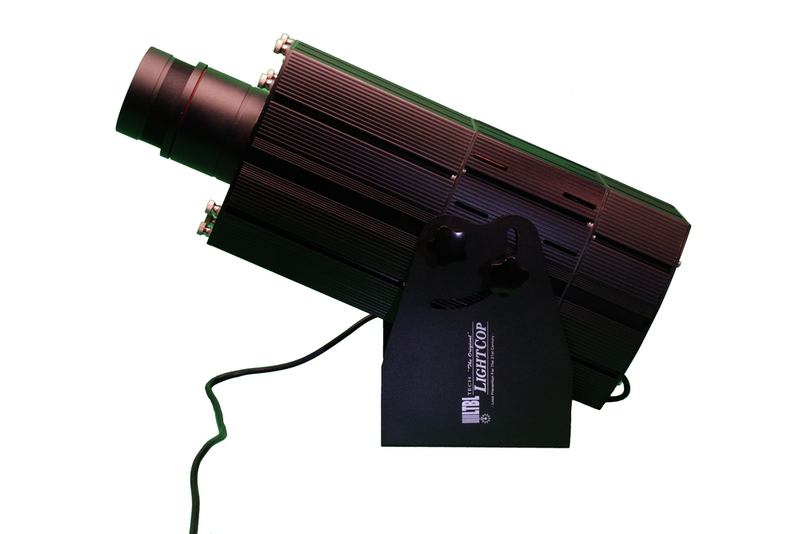 With an IP­65 rating, the completely sealed LightCop is virtually maintenance free. 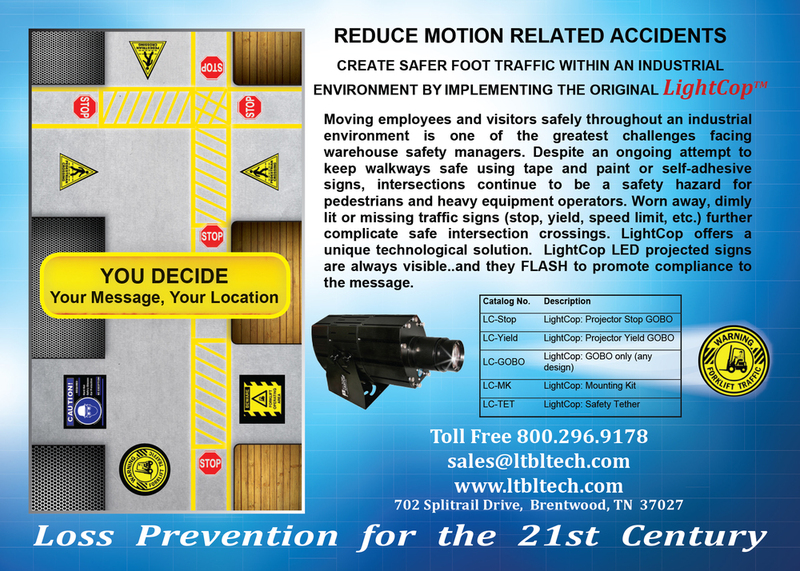 Originally intended for assisting the creation of safe walkways throughout industrial facilities, LightCop also now offers much larger traffic control signage designed to assist with your safety needs in your heavy equipment traffic lane. These five ­to six ­foot GOBO images provide messaging to forklift and other heavy equipment operators. Messaging in the traffic lane can help minimize the risk of accidents and personal injury to operators and pedestrians alike, especially at dangerous blind intersections. Of course no system is fool-proof when it comes to human error, but brightly illuminated safety signage can help drive compliance. It's simple. It's dependable. And above all, it's effective in aiding you to call attention to the safety protocol within your facility. It's the future in industrial traffic control signage. It's LightCop.